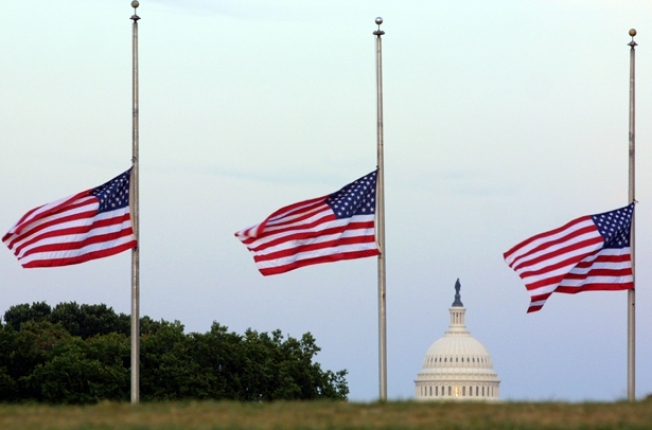 D.C. Mayor Vincent C. Gray encourages D.C. residents to observe the 10th anniversary of the 9-11 this weekend by participating in the events and activities the D.C. government has planned to mark the occasion. In honor of the tenth anniversary of 9-11, on Saturday, September 10th, Children from across the District of Columbia will gather at the John A. Wilson Building (1350 Pennsylvania Avenue, NW 1st Floor Grand Lobby, entrance on D Street) to participate in a discussion about the values of peace in their communities, and the United States. Following the conversation, the children will participate in a ceremony of dropping white rose petals on the attendees as a symbol of peace, to honor the lives lost during the 9-11 attacks. On September, 11th from 12pm -4pm A Special Exhibit “We Remember: Commemorating the 10th Anniversary of the 9-11 Tragedy” will pay tribute to the teachers and students from Backus, Ketcham and Leckie Elementary Schools who were lost in the tragedy ten years ago. The exhibit showcases various gifts and artifacts from around the world that were given to the city and DCPS at the time of the tragedy. It is located at Sumner School Museum and Archives, 1201 17th St. NW and will continue to run through Friday. At 1pm on the 11th a tribute to service – Honoring the Victims, Survivors, and Heroes of 9-11 will feature live entertainment and remarks and reflections from Congresswoman Eleanor Holmes Norton, Mayor Gray, Robert Velasco, Acting CEO, Corporation for National and Community Service; and Amy Smith, Vice President, HandsOn Network. Activities will include additional mini-service projects, emergency preparedness trainings and a volunteer recruitment fair for local/regional community-based organizations. The Tribute will run until 4:00pm. Then at 5:00pm a Candlelight Service: ““Remembering Lives lost…Honoring First Responders,” will commemorate the lives of D.C. residents, students, teachers and chaperones that lost their lives during the terror attack ten years ago. It will also highlight the service and commitment of first responders. City officials, interfaith leaders and others with come together for healing and wholeness. It will take place as the First Baptist Church of the City of Washington, D.C. 1328 16th Street NW (corner of 16th and “O” Streets NW).